When you first find out you’re pregnant, you’re likely to feel lots things at once: happy, excited, nervous, overwhelmed. It makes sense—there’s a ton to think about! Whether you’re already a working mom or a first-time mom-to-be, you probably want to know about your maternity leave, and what rights you have. How long will you take off, how will you get paid, and what are your options if you decide you want to extend your leave—or not return at all. Before you make any decisions, it’s important to know your options and your rights. Parental leave policies vary widely from employer to employer, but all must abide by state and federal regulations. We know it’s a lot to sort through, so we’ve put together the guide below to help answer some of the most common questions about maternity leave and returning to work after having a baby. 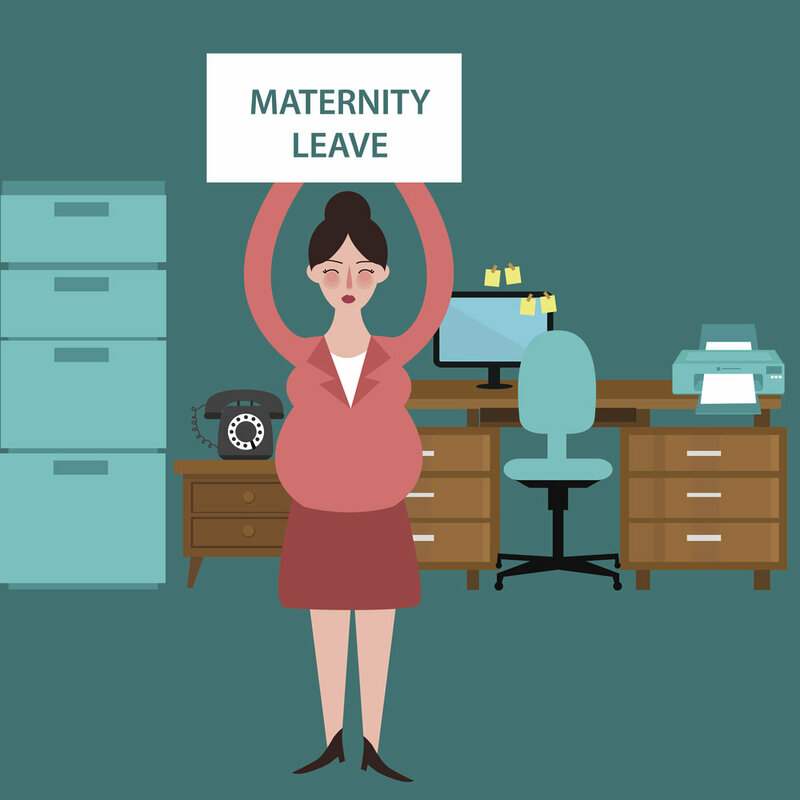 Many companies offer some kind of paid or partially paid maternity leave. Particularly if you work for a large corporation, you’ll likely be entitled to 6 to 12 weeks of paid leave. You may also be able to take additional unpaid leave. Check your employee handbook or with your employer’s Human Resources department. You can also try to negotiate leave if your company offers less time than you’d like to take. There are no guarantees here of course but it doesn’t hurt to ask, especially if you know your employer doesn’t want to lose you. Prepare by finding out what other companies in your field offer their employees and make the case for how your work could be handled while you’re away. One ellie mom was faced with an employer who offered the minimum “leave” required by law for a company of her employer’s size—which, in her case, was short term disability (six weeks for vaginal delivery and eight weeks for C-section, of which five weeks were paid at 60% of salary + FMLA which was an additional six weeks of unpaid leave). So the total policy was 12 weeks of leave, of which five weeks were paid at 60%. Hardly a “maternity leave policy”. She did her research and approached her CEO armed with statistics about how a more robust maternity leave policy would not only help recruit and retain more females (to her male-dominated profession) but also decrease recruiting costs. As a result, her employer decided to update their policy to cover the remaining 40% of salary not paid by disability. While the new policy wasn’t ideal, it was an improvement. Had she not asked, nothing would have changed. If you know your employer does not offer any paid leave and you can’t convince them to implement one, another option is to purchase your own short-term disability insurance. More on this below. If your company does not offer paid leave, you may still be able to take up to twelve weeks of unpaid leave under the federal Family and Medical Leave Act. This U.S. law provides eligible employees of covered employers with unpaid, job-protected leave for specified family and medical reasons, including the birth or adoption of a child. If you work for an employer covered by this law, your employer must allow you to return to your job after your leave and maintain your healthcare benefits. Note that since you’re not receiving a paycheck, you’ll have to make other arrangements to reimburse your company for the portion of the premium that you normally pay. This might involve writing the company a check, or having the premiums withheld from pre or post leave paychecks. Your employer employs 50 or more employees within a 75-mile radius of the worksite. The FMLA also allows states to set standards that are more expansive than the federal law and many states have chosen to do so. Currently, four states mandate partially paid family leave—California, New Jersey, New York and Rhode Island. Many others have enacted less stringent eligibility guidelines. Bear in mind that FMLA does not require employers to allow you to accrue benefits like vacation time or 401k vesting credit when you're out on leave. This could also affect your salary bonus payments if they require a certain number of days or hours worked. Company policies vary, so check with your employer for details. While some employers offer privately funded maternity leave (i.e. they are paying your salary out of pocket), some employers are technically offering short term disability insurance payments that cover childbirth and postpartum recovery. Unlike company-provided maternity leave, short-term disability policies require an official medical diagnosis under a covered category (pregnancy, in your case) from your doctor. You may be asked to provide your company with documentation before you start receiving payments. Again, you’ll need to consult your employee handbook or HR department to find out about your employer’s practice. Some employers pay the premiums on short term disability insurance for all employees, but other employers only offer this coverage as an option and require employees to pay the premiums. If this is the case at your job, you’ll want to make sure you select this policy if you’re considering getting pregnant. If your company does not offer short-term disability insurance, you may also purchase your own on the open market. Make sure to check what the insurance covers and compare premiums and payouts before selecting a policy. Some of these policies pay 100% of your salary during your leave, but many will pay a reduced portion of your salary—50-66% is common. Importantly, if you are planning on using short-term disability coverage to fund your maternity leave, you must have a policy in place before you conceive. You will not be covered if you start your policy after you’re already pregnant. How long to take off work for maternity leave is a very personal decision. You’ll need to think about what’s best for you and your family, as well as how your leave will affect your financial situation. Many women take between 6 weeks and 6 months maternity leave, putting together a combination of paid, partially paid, and/or unpaid maternity leave as well as using saved up vacation time, sick days, or other allotted paid-time off from their employer. Some women discover that despite what they’d planned, they no longer want to return to work after maternity leave. This is fairly common, however, you’ll want to know how this decision impacts any benefits you’ve received on leave. If you’ve used employer-funded maternity leave (rather than short-term disability or FMLA leave), you may have to pay back some of the salary or benefits you received. Once more this is employer specific, so it’s back to the employee handbook or HR for details! You may also want to return to work part-time after the birth of your child. Check with your employer (or ask around discreetly, if necessary) to see what your options are. Some possibilities might include working from home and/or a job share with other part-time employees. Consider talking to your boss about where you can pump milk at work (if you decide to breastfeed). The Break Time for Nursing Mothers law requires FLSA employers to provide break time for women to express milk and functional space that is not a bathroom each time they need to express. New York City recently passed a new lactation law which provides that employers must provide a sanitary room (other than a restroom), where employees can express breastmilk “shielded from view and free from intrusion.” Not only must this room include an electrical outlet, a chair, a surface on which a breast pump and other personal items can be placed, but it should have nearby access to running water, and be in reasonable proximity to the breastfeeding employee’s work area. The employer must also provide a refrigerator suitable for breast milk storage. Don’t be afraid to ask for what you deserve and is required by law. If you’re having a hard time explaining why you need a private and clean space to pump, this article is a great resource to reference. Both men and women are covered under FMLA, so a non-birthing parent may also take leave under the same stipulations outlined above. Some companies also offer paternity or birth partner leave; this is more common at larger employers. In any case, you’ll want to find out your partner’s employer’s policies, and determine if you’ll plan to take your leaves together or consecutively. We hope this guide has helped you plan for your maternity leave! We know this can be a lot to digest—please feel free to ask any questions you may have in the comments below or through our parenting app (available on iOS and Android), where there is a whole topic on Working Moms.